Congratulations to former Blue Caps member Eric Whitehouse on receiving an award from The Mayor of Stockton-on-Tees Borough Council, Councillor Eileen Johnson, on recognising his outstanding contributions to the Borough of Stockton. He received a Health and Wellbeing Award at the Newtown Community Resource Centre in Durham Road, Stockton, on Monday, March 25th. You can see a copy of the award by clicking on the above image. Photographs © copyright Stan Laundon. Can we bring to your attention the Fabulosa Music Festival which is taking place at The Crathorne Arms on Bank Holiday Monday, May 6th, 2019 between 3.00pm and 10.00pm. I won't list all the artists taking part as you can see the star-studded bill on the poster above and the flyer below which can be viewed larger when you click on it. It's good to hear that the tickets have already sold out - so well done all concerned. However we are leaving the poster on the page so you can keep checking to see if there have been any returns. Proceeds are in aid of The Trinity Holistic Centre at James Cook Hospital in Middlesbrough. Performing Musicians, Performers and Bands and Art in the Marquee - click to enlarge it! How it all started: For almost fourteen years I lived on the Costa Blanca in Spain. Following a visit I made to my hometown of Hartlepool in June 2004, it was suggested to me to start a web page featuring some of the old bands, or groups, that graced the pubs and clubs of the area back in the 1960's. The idea started after Billy Crallan, George Hart and Ed Saul all joined forces to play some of the old songs to help celebrate Ron Blair's 60th birthday. Billy Crallan, Ron and I played together in The Trakkers and George, of course, was the original lead guitarist of The Hartbeats. 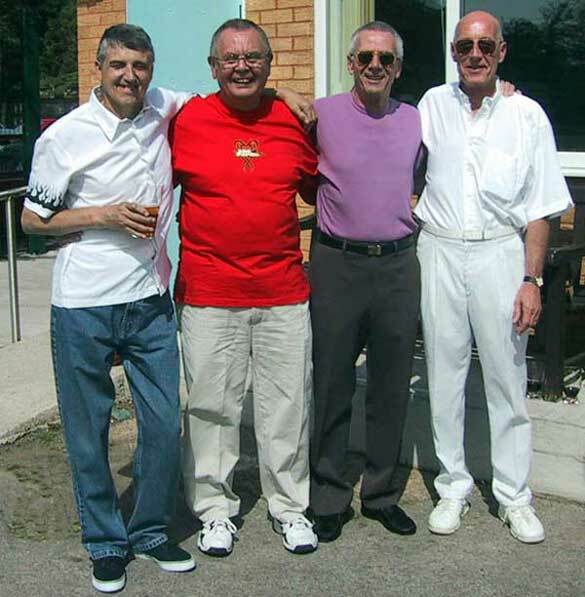 The photograph above shows George, Billy, me and Ron at Hartlepool Cricket Club. So, what started as an idea has now expanded into many pages and is dedicated to the great bands of that era and the friendship we all enjoyed. Photograph © Marion Crallan. If you'd like to be kept up to date with any changes we make to our bands pages do drop us a line through our Contact page and your name will be added to a list to receive periodical emails.